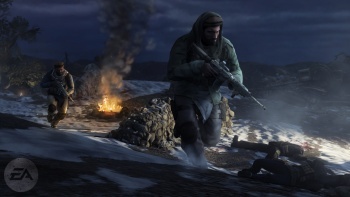 Despite the last-minute decision by EA to drop the Taliban from the multiplayer portion of the game, the U.S. Army says it still won't allow Medal of Honor to be sold in on-base stores. The Army was quick to move once word got out that gamers could play as the Taliban in Medal of Honor, banning the game from on-base GameStops and PX operations around the world out of "sensitivity to the life and death scenarios this product presents as entertainment." In spite of that, and the far more strident criticism that emerged from other quarters, EA stuck to its guns, right up to the minute that the game was due to go into open multiplayer beta. Then, suddenly, the Taliban was gone, replaced by the generic, presumably-less-offensive "opposing force." Amid all the counter-uproar that maneuver caused came word that the military might reconsider the ban. EA didn't come right out and ask but it did take the time to "clarify some facts" about the game, while the Army said it "has been, and continues to be, engaged in a thorough review to fully understand the extent of the modifications." But it appears to be a case of too little, too late, as the Army confirmed that the restriction will stay in place. "Out of respect to those touched by the ongoing, real-life events presented as a game, Exchanges will not be carrying this product," said Army and Air Force Exchange Service Commander Maj. Gen. Bruce Casella. "While we regret any inconvenience this may cause, our position is consistent with the direction stated a month ago. I expect the military families who are authorized to shop the Exchange are aware, and understanding, of the decision not to carry this particular offering." The final verdict may be disappointing for EA but it's hardly surprising. The name is gone but nothing else was touched, so while it may be an affront to those who believe that it's time for videogames to be treated with the same respect as film, television and books, from a practical perspective it really doesn't mean much at all. I don't like the idea of pretending that the enemy in Medal of Honor is anything other than what it really is, but it's nice in a way to see that the Army's position is informed by more than just cheap marketing.